Seventy-five percent of the time, whoever attacks first wins the point (this statistic applies to two offensive players in competition). One of the questions players most frequently ask me is, “Samson, how can I attack first?” Here are four tips for the beginning player on how to initiate the attack. Get ready to attack. You must anticipate every ball coming long enough to loop. After serving, get back in your low ready-position waiting for the deep ball; when receiving serves, look to attack if the ball comes long. Serve short, low, backspin. With a very low serve that bounces twice on your opponent’s side, it will be very difficult for him to get beneath the ball to flip it. Return short serves short. If you can’t attack your opponent’s serve, then keep him from attacking by dropping it back short. You might get the opportunity to attack the following ball. Flip your opponent’s serve. 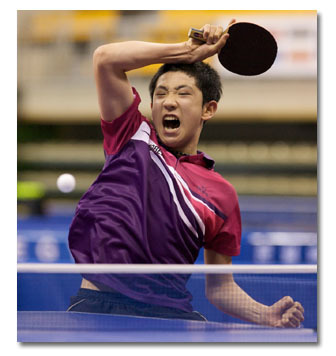 The flip is an attack which is especially effective if placed to the backhand or middle. Your opponent will often block your flip, which can be followed up by your strong attack. If you and your opponent are exactly the same level and both are able to attack an equal amount of times, then consistency is the key. Within being the most consistent, the one who has the best spin variation, speed variation, and ball placement will control the table and hold the advantage. This entry was posted on Wednesday, March 23rd, 2011 at 2:01 pm	and is filed under Coaching, Tips. You can follow any responses to this entry through the RSS 2.0 feed. You can leave a response, or trackback from your own site.